OWNERS Gloria, Richard and Beverly Pink celebrate 77 years of business by giving to charity. The iconic hot dog stand served 77-cent hot dogs for 77 minutes to mark the special occasion. 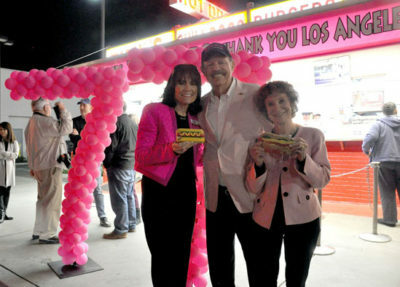 In addition, Gloria, Richard and Beverly Pink were on hand to welcome hundreds of customers who lined down La Brea Ave. for the chance to order a discounted dog for charity. All proceeds from the 77-minute event were donated to the Bob Hope USA at Los Angeles International Airport, which benefits those who serve in the U.S. military. “Tonight we honor courageous soldiers by giving 100 percent of proceeds from the event to the Bob Hope USO,” said Richard Pink.